We’ll be uploading a series of short videos showing the Vermont Bicycle Shop Adventure Team’s preparation for their bicycle adventure to Puerto Rico. This video we give you some advice about bicycle chain quick links and which ones might work best and how to use them when you’re out on adventure. Each year at Vermont Bicycle Shop we try to come up with at least one wild and wacky and outlandish adventure. Our first year we invited everyone we could think of to join us for what would become a yearly tradition, a beginner friendly overnight bicycle and canoeing camping adventure to the remote camp sites at Osmore Pond. Later that year our buddy and all around survival and outdoors expert Kevin led us on an all day hike up and over Mount Mansfield so we could ride our GT Snow Racers down the mountain. We had practiced some on Smuggler’s Notch Road before the trip. It was still the fastest most of us had ever gone on a sled, some of us hitting as much as 47 miles and hour! The next year we rode our bikes through the mountain bike trails of Lyndonville and and then to the top of one of the tallest paved roads in Vermont. We camped overnight at an abandoned military installation outside of Lyndonville. A place rumored with all kinds of wacky and spooky lore. So naturally we planned our trip for the weekend around Halloween. It turned out to be one of the hardest bicycle overnights any of us had ever done. Let’s go bike touring in Puerto Rico. Vermont Bicycle Shop with the generous help from our VTBADV Team sponsors, Honey Stinger, Orbea Bicycles, Kali Protective, and Shimano will take ten men and women ages 30 through 70 to Puerto Rico where we’ll explore as much of the island by bicycle as possible. When we first talked about the trip we knew we wanted to go somewhere warm with our bicycles in the middle of the cold season. Ginger loves the heat. I swear I’ve found her napping in the sun spot in front of the window with our cat in July. We also wanted to travel where we would have the most positive impact possible. In both our presence, our dollars, and our lasting impressions in both the destination and here at home. We talked about a lot of locations, including Cuba. In the end with logistics playing a heavy factor we decided on Puerto Rico. Isn’t Puerto Rico a mess from the hurricanes? This is the biggest challenge currently for most of Puerto Rico, this persistent rumor that the island is some sort of torn landscape out of a post apocalyptic world. It’s not true. While the island suffered terribly from the hurricanes and struggled greatly to find support in their efforts to rebuild, they’ve also persisted in getting back to their normal lives. There are places in the rural sections of the island where the effects of that hurricane season still hamper life. However, the biggest issue to come from Hurricane Maria is the rumor that this once fruitful and amazing tourist destination is no more. Its kept tourists away. With tourism being significant part of the Puerto Rico economy it’s important to bring tourists to the island to help push what was a recovering economy prior to Hurricane Maria back out of recession. When we met as a team, we decided this is where we could have the most positive impact. We could help Americans who are ready and willing and have done the hard work to bring people back to their island. It helped that Orbea also has a great presence. Not really, in fact, flying to Puerto Rico is half the price of flying to the Midwest. HALF. Lodging is also very affordable. We found an Air BnB that could house all of us for about $400 a person for 7 days. Food is surprisingly affordable considering that Puerto Rico has to import most of their goods. While not everyone on the team can join us on this trip a lot of us were able to work out ideal times and dates to maximize traveling together on this trip. Even though it is the furthest the team has traveled, it will also be the most attended team trip to date as well! Steven Maas – Bio and Photo coming soon! Kris Hunt – Bio and Photo coming soon! Tom Stuwe – Bio and Photo coming soon! Barb Schwendtner – Bio and Photo coming soon! Meredith Bell – Bio and Photo coming soon! Mark Yorra – Bio and Photo coming soon! Kit Gates – Bio and Photo coming soon! Norma Grier – Bio and Photo coming soon! Eric Nusbaum – Bio and Photo coming soon! Ginger Cloud – Bio and Photo coming soon! Darren Ohl – Bio and Photo coming soon! We’ll be posting videos and photos leading up to our trip and we’ll be sharing as much as we can with everyone so that they can plan their own version of a trip like this. We want to take a moment to thank the brands who are working with us on this trip, Honey Stinger, Orbea Bicycles, Kali Protective, and Shimano. We hope you will take a moment and check out what they have to offer in our store and through our websites and theirs! Keep an eye on Vermont Bicycle Shop social media sites as well. We will posting up a few live videos and such and there may even be some product give aways leading up to the trip. We’re excited we get to share in our latest, and I hope to be wackiest and most-out-there adventure yet. Some pretty big stuff has happened since I last wrote an entry, but for now I’m going to step back to recap a fun ride that I did just before winter hit here. 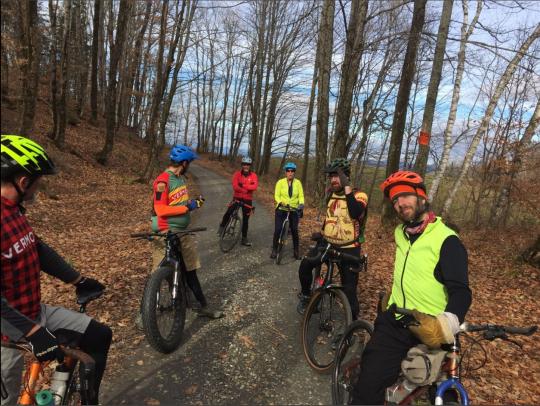 There’s a great and eclectic group of people that I’ve connected with through the local bike shop, Vermont Bicycle Shop, who are part of the shop’s “adventure club.” It’s not exactly a team, and not exactly a club in the traditional sense, and not exactly anything else. It’s a somewhat loose collection of people, most of whom hang around the shop fairly frequently, who get together and go on halfway madcap rides that deliberately seek out challenging, weird or nonsensical destinations and routes. The one thing I’ve seen that this ragtag band of cyclists (in the broadest of definitions) all have in common is that bikes are an extension of their identity in one way or another. Lots of people enjoy cycling; for these folks, the line of distinction between themselves and the bicycle is hard to find. I’m the only triathlete in the group, and one of the few with a roadie background, so I amicably bear the brunt of a lot of jokes about aerodynamics and fancy equipment. I don’t mind. It’s always good to receive perspective from others, and there’s plenty of opportunity for me to jovially strike back when the mood is right. The group gathered at my house, as it was the ideal starting point for this particular loop. 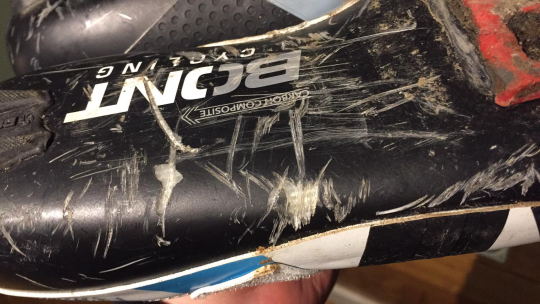 That gave everyone plenty of opportunity to make fun of my brand new Bont triathlon shoes, which I had just gotten fitted since literally tearing the soles off my ancient pair of Garneaus. Considering it was about 35 deg. F and these shoes are basically open-air slabs of carbon with velcro straps on top (they don’t even have a tongue), they were definitely an unusual choice for the day. They were my only choice, though, apart from putting platform pedals on my bike and wearing hiking boots. I was too excited to try them out to miss the chance, so I doubled up my socks and stuck some plastic baggies over my toes in between and let the ribbing fly. We set out, starting on dirt roads and heading further away from civilization as we went. One of us realized he had a soft tire, but luckily we were riding right by his house so he stopped to swap out his bike (the N+1 rule is widely followed in this group. I’m an outlier, having a mere two bicycles in my possession). No big deal, and we continued onward. Some of my favorite parts of the day were when we paused to regroup, and found ourselves in a serene section of the forest, where nobody was around, but there were quiet signs of life if you knew where to look. A farmer’s field, just through the treeline. The peripheral lines of a sugarbush down the hill. An abandoned cabin by a pond, once idyllic, now forgotten and reclaimed by the encroaching wilderness. Artwork on an old barn. These are the moments that give ‘adventure biking’ its definition for me, personally. But everyone has their own ideas of what it means, which is part of why it’s such an interesting thing to do. Our first Class IV section was traversed with great enjoyment, and spilled us back out onto a dive-bombing gravel road that intersected suddenly with a main asphalt town highway. Brakes were vigorously applied. Luckily, none failed. From there, a decision was to be had. Do we continue on the planned route, or do we diverge back into the woods to tackle a serious Class IV section that promised adventure of the hardiest sort, an incredibly technical downhill on terrain that could only be called a ‘road’ if you squinted real hard, were slightly drunk and had never seen a river before? I had the suspicion that this was the plan of the ride’s organizer (shop owner and mechanic Darren) all along, and that he lured everyone in with the relatively sane route in order to spring the change of tack on them at the fateful moment of divergence. It wasn’t a far stretch with this group; the decision was all but foregone. Plus, Darren brought snacks. So off we went. To adventure! Getting to the challenging bit required some more climbing on dirt roads, which was fine by me. I love climbing, and I love doing it on dirt roads, now that I’m the proud owner of an Orbea Terra, which is basically a carbon frame road bike with almost-all-terrain tires. I felt great and looked forward to every foot we went up. Back into the woods we went, and the challenge was suddenly upon us. Photographs and videos unfortunately can’t do it justice, and my phone died from the cold before I made it to the bottom, which is where the better perspective would have been provided. But picture a steep hill in the forest. Now, make it twice as steep. Now, rake out all the trees in an 10-foot-wide swath, straight down the hill. Then erode it with wind and particularly water for about 100 years. Find all the boulders and rocks under the soil that you can, and leave them there. Call it a “Class IV” road. Now get on your bike. Those riding fat bikes were the only ones to make it down successfully. The more experienced riders on gravel bikes generally made it about halfway. Darren made it ¾ of the way down, displaying excellent bike handling skills, but then missed a line and over he went. He was certain he’d cracked his frame and damaged his drive train because he landed right on a boulder, but he miraculously evaded consequences. For my part, I stopped about halfway down and walked. I knew there was no way I was going to survive the descent without falling, and I didn’t want to break anything – on myself or my bike. What I hadn’t accounted for was my shoes. Walking down a mostly-dry glacial riverbed meant I was slipping and stumbling off boulders with every step. Not exactly the surface a pair of triathlon shoes were meant to walk on. After I got home later, I photographed the bottoms of my brand new babies and sent the picture to Darren in horror, asking if I had just ruined everything. Luckily the damage is largely cosmetic. But I’ll be re-thinking my footwear choices for this kind of ride in the future for sure. Once we all made it down, across an intersecting stream bed and up a hill on the other side, it was back out onto gravel roads and onward to home. We had all met a challenge together, survived it and had a blast doing it. Exactly what an adventure ride is meant to be. Yes, Rickie’s Indian Restaurant is located in the back of a gas station convenience store… Yes it is delicious! The restaurant has a clean kitchen with genuinely kind people, this is an authentic Indian food experience. There is a small clean dinning area, however I have only ordered take out. I love Indian food! My favorite dish is the Baingan Bharta, a roasted mashed eggplant dish with seriously yummy spices served hot. I am generally able to get three meals out of a serving. It’s a great meal to split or bring home leftovers. The food is packed with flavor and has a bit of a spicy kick. We are so thankful to have access to Indian cuisine in this part of Vermont. We highly recommend Rickie’s Indian Restaurant. Additionally, the store has a full deli for anyone that would prefer a different flavor of food. Haribol! While living in Eugene Oregon my bicycle was my main mode of transportation for a solid seven years. I biked to work and most places around town, average distance three miles. My bike was a way to get from place to place more quickly than walking. The thought of riding for pleasure or up a steep hill or for any significant distance was foreign. Through being in relationship with my husband Darren for the past five years, I have a completely different perspective on biking, where it can take me and the gear that can help me find comfort on rides. This blog, The Mechanic’s Wife, will share tips about riding challenging terrain, equipment to support distance riding, and strategies that I have found helpful as I transform from a get around town bicyclist to an adventure cyclist. Where you look is where you will go – This is a great life tip on and off the bicycle. Use caution to keep your eye on the path you want to follow and avoid focusing on the ditch or before you know it, you will be in it. My best friend – My wicked wide range 11-40 cassette. A cassette is a rear gear cluster on a bike. The bigger the range the more options for easier pedaling. The 11-40 cassette gives me an edge getting up hills and helps reduce self-defeating thoughts during a tough climb. Counting – There are different strategies that I have found helpful when I am struggling to stay on my bike up a steep hill. Sometimes I meditated on my breath or the beauty of the moment knowing I will never experience this hill the same again. When I am in agony and need distraction, I count. One two three … twenty-eight twenty-nine… ahh made it. Not that long ago I would do anything to avoid hills, now when I see one ahead I smile. Ginger and Darren set out to explore the abandoned roads that lead to the top of East Mountain and Radar Rd. 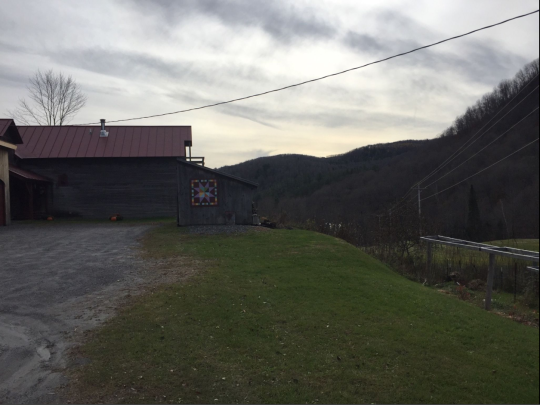 One of the most unique destinations in Vermont also serves as one of the more difficult climbs in Vermont. Early morning is best for this ride. We didn’t see a single person on our way up, we did run into some folks at the top and a few on our way back down. If we had even been an hour earlier I don’t think we would have seen anyone. We parked at a small pull off on School Street/Mountain Road/Radar Road (depending on what map you are looking at and how far down the road you have driven). We parked at the gate just north of East Burke on Mountain Rd. The gate has a sign that says Keep Out. The gate is not locked and many locals have opened and driven through it. It’s clear the gate is to make sure it’s a locals only kind of spot. There were a couple of cabins and Vermont “camp” sites after the gate. Radar Rd. is a federally owned right of way, technically blocking access to the road is illegal. From here there is a short ride up to the first gate. This gate says keep out, it is over a public right of way, which in Vermont is technically illegal to impede the public right of way. This is why the gate is not locked. This section of the road is not private land. The sign and the gate serve as a way to keep the amount of traffic down and hopefully keep away would be trouble makers of the motorized kind. We met a few locals who were servicing their camps on the ride who seemed quite friendly and happy to see us out on bikes. This first section of Radar Rd. is a mix of the old paved road and graveled over surface. Towards the top of the first climb is a staging area for the gravel upkeep of the logging roads used on the land. The land that is home to the LAFS Radar base is owned by a logging company. They are more than permissive about allowing non motorized recreation on their land and the few workers we did see were friendly enough to wave. Respect their friendly nature and leave no trace. After the first climb there is a longer, easy descent that will at times seem flat. At the bottom of this descent is the left turn that is the private portion of Radar Rd. It’s a 4 mile climb to the top that will be as steep as 18% at times and sustaining sections of 12% and 15% grade. It is not technical however it is steep. About a third of the way up is a nice rest stop before the real difficult stuff. The housing for those stationed at the base is the most frequently visited as it is still accessible by car. There are usually a couple of cars parked here. Usually by people who have come to hike the road to the top. We didn’t see a single person on the way up, however we did see a group at the top and met a couple of people on our way back down. Someone takes care of this place as the pavement was super clean. It would be amazingly difficult to get lost, especially from this point as it is all paved road from here. There is a group that takes care of the base and cleans up. They do an amazing job. We recommend at least picking up and taking one piece of litter back down with you when you leave. Do not enter the buildings, do not move anything, do not touch anything. Simply look. There is so much to see up here. The views are incredible. For me, the ride up and back down were far more magnificent than the actual top. It truly is one of those places where the journey can be just as rewarding as the destination. After the Bunk Houses the real climbing begins. The road narrows as nature is slowly overtaking the road from the sides. There were no trees down across the road the whole ride up. A short rest on the way up. It’s a hard climb. There are a couple of spots that offer some great views and serve as a nice break. I’m sure we’ll be taking breaks. Here is a map of the ride. Click the map for access to the GPS file and more details. As with any adventure ride be sure that you or someone with you have wilderness navigation experience as well as the appropriate supplies to experience this adventure safely. If you are unsure of the supplies to bring along on this ride, then you need to bring someone with the appropriate experience with you. Just on the other side of Highway 232 from Groton state forest is a section of Vermont we’ve nicknamed Hardwood Mountain. So named for the peak near the top of the jeep trail/class 4 road that we often ride when the mountain bike trails are closed. We’ve ridden many sections of this ride as parts of other rides which fed our ambitions of making a larger loop that connected all the interesting parts of those rides into one big loop. You will find a map image with an overlay of the elevation profile at the bottom of this article. It is linked to a more detailed profile of the ride where you can also download a GPS file. Do not ride this route without a GPS and a working knowledge of wilderness navigation. Our route map shows some of shoots where we took wrong turns or where we chose to explore a little during the ride. Our adventure that took most of the day and netted the results we were after; a 20ish mile loop of primarily car free roads and trails. We didn’t see a single car any of the sections we rode that day, including the short section of Hwy 302 we had to ride to make the connection. It was a great car free day. Of note: This area of 302 has significant amounts of bicycle traffic and a wide shoulder, making the short 1/4 mile connection easy and safe. The ride starts at the corner of Seyon Pond Rd. and South Branch Rd. There is no designated parking however it is common for folk to park on the side of the road. Make sure you are not impeding traffic or parking in the grass. Don’t be a weirdo, just park on the side like civilized people do and you will be fine. Head South East on Sayon Pond Rd. to 302. It’s best to cross 302 and ride the should so you are riding with traffic. Coming across a bicycle at 50 mph on the wrong side of the road can be a shocking surprise to drivers, don’t be that way, ride on the right side of the road. A 1/4 mile down 302 you will see Hi Goodwin Rd. Head up this road for about .5 or .6 of a mile. 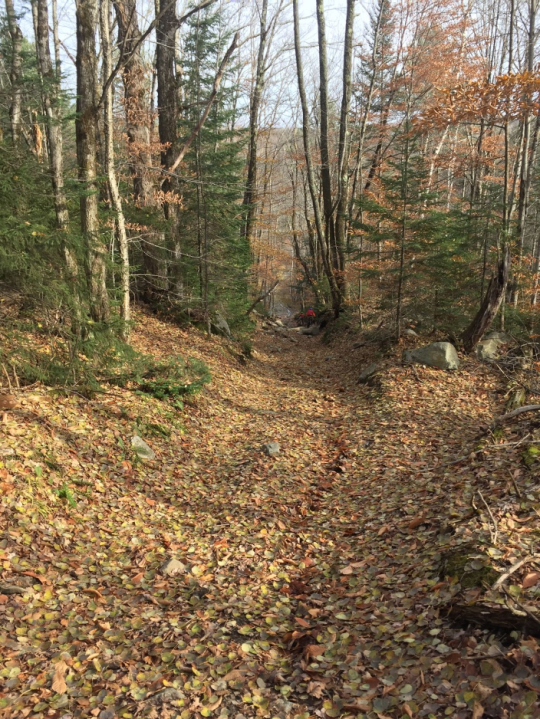 This is the trickiest part, finding the old carriage road. Facing North you will see the power lines running off to your right, the road becomes a driveway turning off to your left. Just to the left of the first power line tower through 100 to 200 feet of tall grass we just barely made out the clearing of trees that was the old carriage road. It might have been used as VAST in the Winter, most likely it was last used for logging, though it looked like that was 20 years ago at best. There is certainly some hike a bike in some short sections otherwise it’s a pretty cool and technical part of the ride. It’s on par with some of the old school black diamond trails at Millstone. At the end of the carriage rd you will come out to a clearing where logging happened a couple of years ago. With fat bikes we could have easily ridden across the brush had we known how quick and easy the connection was to an extension of Old County Rd. This part of Old County Rd is on private land, however, the landowners have left a sign on the gate for this road stating that non motorized recreation is allowed. I make it a point to leave a thank you note in a zip lock bag when I come across section or places that have clearly been cared for by volunteers or landowners who do exactly this sort of thing. I like to think that finding an unexpected note in such a remote place is a great way to brighten someones day. Turn right on Old County Rd. and follow it downhill. Be careful! There are two “gates” on this decent, one is the real deal iron bar gate, the other is simply a cable strung across the road used to keep motorized traffic out. There is a sort of triangle of roads here formed by Ricker Mills Rd, Old County Rd, and 232. Turning right at Old County Rd off of Ricker Mills Rd. and then making a right on 232 to get to the next section, the Groton Rail Trail. You can see here we missed the turn and went back. Our goal was to make sure we road the route we were suggesting. If you miss the turn you can see it’s not a big deal, you will just make a right turn at 232 instead of left. Follow the rail trail all the way up to Turtle Head Pond. You will pass Boulder Beach/Stillwater State Park and you will cross Hwy 232 again. Turtlehead Pond is the first major pond you come to after passing Laneboro Rd and the entrance to the Marshfield Ledge. We’re looking for a road Sometimes called Bailey Pond Rd. and sometimes Jerusalem Rd. We call this section Jerusalm Rd. as this is the label for the part of the road that we were looking for. It is at a crossroads at the North East end of Turtlehead Pond. It will be obvious from the very large boulders stacked on the road blocking motorized traffic from entering. It’s steep climb at the start and then relaxes a bit. The next section will require some serious attention to your GPS or map. If you are navigating this ride by map you should be an expert map navigator as this next section can be exceptionally tricky. The right turn onto Jerusalem Rd. proper is incredibly easy to miss. It is well hidden in the middle of a very fun downhill. With some experience with the route it can even be incorporate into the downhill without slowing down. If you’ve never ridden this section just go slow until you find the turn. The entrance to this section is overgrown, however, someone who lives out here has clearly been riding this section with a motorcycle so the entrance is visible as long as you are moving slow and looking for it. If you end up in a swampy marsh you have gone way to far, turn back and wallow in your failure while you head back up to the road you’ve missed. The descent from here is truly amazing and one of my favorites. It’s fast and technical, it rivals any proper old school New England downhill mtb trail. Boulders and roots and ruts lead give way to a gravel road. Jerusalem Rd comes out to Laird Pond Rd. Make a left and begin the torturous climb that is Hardwood Mountain in Reverse. It’s 5 miles at an average of 9% grade. Not terrible, however after the last 17 miles it can be a mean climb. Laird Pond Rd leads up to Holt Rd which is where you will find the left turn to Hardwood Mountain Rd. proper. It really is a pretty road. I prefer to descend this road, but that’s another ride. We usually stop at the top at the beaver pond for a lunch. Oh yeah, there is a beaver pond with about 3 feet of water over the road at the top. You can ride through it, we usually walk over the two beaver damns on the side of the road. It is possible to get past it without getting wet. There are several other very big puddles on the road after this that are passable in the same way. As you descend down Hardwood Mountain Rd you will want to be on the lookout for the unlabelled South Branch Rd. turnoff on the right. If you miss it, it’s no big deal, Hardwood Mountain Rd comes out on 232 where you can cross and connect back to the rail trail and follow the route in reverse back to your car. The climb up South Branch is an awesome proper mountain bike trail at times. And the descent back to the parking is a blast.